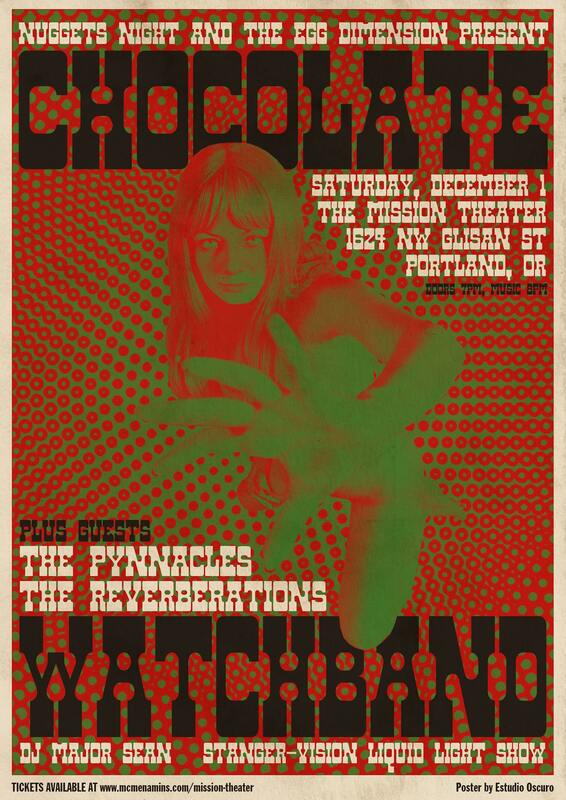 Nuggets Night presents The Chocolate Watchband at McMenamins Mission Theater on Saturday, December 1st. Special guests The Pynnacles & The Reverberations. WHY: Because it doesn’t get any better than this! VIP tickets are $60 and secure you the best seats in the house, a goody bag full of amazing treats, and the opportunity to enjoy a meet and greet! Iconic California psychedelic punk legends The Chocolate Watchband are touring to celebrate the release of the new album (released by Dirty Water Records), lead by founding and current members, vocalist David Aguilar and guitarist Tim Abbot, plus Gary Andrijasevich on drums. New members, guitarist Derek See and bassist Alec Palao (Grammy-nominated producer), bring youthful garage rock vibe to the iconic lineup. Documented as influencing The Damned and countless punk and psych bands, their live performances sizzle with the same outrageous audacity of the late 60s scene they helped create as featured bands in movies such as Riot on the Sunset Strip and The Love-In (featuring their hit song Are You Gonna Be There). Their early works were produced by Ed Cobb (produced/engineered 32 gold & platinum records and nominated for 3 Grammy awards, Cobb wrote hits like The Standell’s “Dirty Water” and worked with The Standells, The Piltdown Men, Fleedwood Mac, Steely Dan, and Pink Floyd). Rebellious and hard-edged, The Chocolate Watchband combined influences of blues with a psychedelic power that featured terse lyrics and instrumental experimentation. To this day, they perform all over the world with legends Little Steven, The Yardbirds, Love, The Zombies, Bo Diddly, Iggy Pop, the Strawberry Alarm Clock, and the Electric Prunes. Still rife with hunger and seismic rumbles of the hippy revolution’s punk transformation, The Chocolate Watchband continues to be embraced by new generations of fans. Their newest songs sizzle with genuine political rebellion in our current times and are destined to be classics.